I know you are busy but I hope you have time to read this. Firstly I must compliment you on your exhaustive effoets in compiling sucg a detailed public record of the brave men who participated in the dams raid. My interest in the Dambusters is not related to any family participation, although my father was a fighter pilot with the RAAF in New Guinea in WW2, but originates and has continued from my being taken to see the movie at a local theatre by my father and grandfather, I think in 1956. I still have vivid memories of a huge model Lancaster perched on top of the street wning of the theatre. I was hoping to source a photo but no luck. Unlike in the UK there seems to be little interest in the 70th Anniversary of the raid in Australia despite the Australian contribution. I am however trying to get the Newcastle press interested in running a story on Jack Leggo from P-Popsie and Robert Kellow from N-Nuts. In my reasearch I discovered that Leggo transferred to flying duties in September 1943 and flew 12 missions with 12 squadron RAAF in Sunderland. ” This officer has an exemplary character, loyalty, conscientiouness, and devotion to duty have been unwavering over a period two years to my knowledge. No higher standard could be asked for. I hope this is of interest and assistance to you. I havn’t attached a copy of the archive record as there doesn’t appear to be that capability on your Blog but will do so if you give me your email address. 2 things ! 1 Martins plane had its right side wing shot up during the attack, right side fuel tanks was hit, luckily they were almost empty along with Flap damage..
2 the bomb had a pistol fuse which was designed to go at a certain depth, i doubt the bomb would of been armed anyway while they were loading it, that’s not to say it didn’t scare the crap out of them. Also when Martin was in charge of the R A F in Germany, he politely sent Barnes Wallis a challenge to try and do the raid again, some friendly Australian Banter. Martin’s crew were never involved with dropping Tallboy bombs. They did use the light case 12,000lb bombs, basically three ‘cookies’ bolted together, such as those used against the Dortmund-Ems canal. The first Tallboys were dropped on June 8th on the Saumur railway tunnel, some 5 months after Martin had been rested from 617. 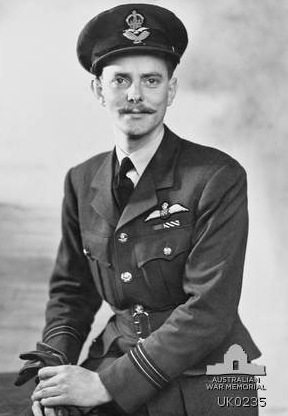 In his capacity as AOC, Air Support Command, I had occasion as a lowly Leading Aircraftsman to write to Air Vice-Marshal Martin in 1969 following the death of my father while I was on detachment at RAF El Adem, Libya.The Royal Air Force went to considerable efforts to fly me home on compassionate leave. I wrote to AVM Martin to record my gratitude and was amazed to receive a two page hand written reply from him expressing his condolences. A truly remarkable gesture from a great warrior of the skies and something I have treasured all my life.